What can I expect during my LASIK evaluation? 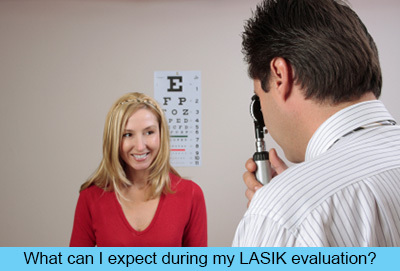 The first step towards having your LASIK surgery will be to undergo a comprehensive evaluation by your LASIK surgeon. There are a number of questions that your doctor will ask of you, and you will have the opportunity to ask all of the questions that you have about the procedure. Prior to your evaluation by your LASIK surgeon you will likely be instructed to avoid wearing contact lenses so that your surgeon will be able to get a complete idea as to the condition of your eyes, without the irritation that is so often seen from the use of contact lenses. Corrective lenses like contact lenses will often cause the cornea’s shape to change, and it is important that the surgeon see the cornea in its natural state during the LASIK evaluation. You can still wear corrective lenses if you wear glasses, however. LASIK patients are often advised to keep their hard contact lenses out for at least 3 days for soft lens wearers and a few weeks for rigid contact lens wearers prior to their LASIK evaluation. Your surgeon may request to see copies of your previous eye care records, but this is often not as important as it is to have a clear look into your eyes during the examination. You are typically advised to bring your corrective lenses or contact lenses with you to your appointment. There are three types of vision concerns that LASIK can correct. These are astigmatism, myopia (nearsightedness), and hyperopia (farsightedness). If you currently wear corrective lenses due to presbyopia, which is the natural loss of vision that occurs due to aging, then you will likely need to continue using corrective lenses for reading after you have the LASIK surgery. Even those who have undergone successful LASIK find themselves needing to wear reading glasses as they age. When you meet with your LASIK surgeon, he or she will provide you with extensive details relating to the types of laser vision correction procedures that best relate to your eye concerns. Your surgeon will also consider all of the visual needs that you have for both working and leisure in order to provide you with relevant options for your refractive surgical procedure. You will have plenty of opportunity to discuss the questions and concerns that you may have about the procedures and you will have the benefit of being face-to-face with the surgeon who will be performing the procedure on your eyes. During the exam, your pupils will be dilated so that your LASIK surgeon can get a thorough look into your eyes. The pupil dilation can result in blurred vision that could actually last as long as a full 24 hours. With this in mind, LASIK patients are encouraged to bring a driver with them to their appointment so that they can get home safely. The next phase of the eye exam will involve a detailed evaluation of the cornea. This will include getting an idea as to the thickness of the cornea, the curvature, and topography mapping will be done. A retinal exam will be done in order to get an idea as to the overall health of the retina, as some retinal disease will exclude patients from becoming good candidates for LASIK surgery. A glaucoma screening will also be done so that the risks of glaucoma can be better understood for each patient, as glaucoma can also potentially exclude patients from being qualified LASIK candidates. One of the other tests that will be conducted during the LASIK evaluation will include the measurement of the refractive error. This part of the process will allow the LASIK surgeon to formulate the plan of treatment in order to ensure the greatest possible success during the procedure. The LASIK evaluation can take a few hours, due to the specialized tests that are performed in order to evaluate and measure the severity of your eye refraction issues. The length of time between your initial LASIK evaluation and the day of your procedure will depend entirely on the schedule of the ophthalmologist, and on your ability to make payments toward the cost of the procedure. Insurance companies rarely cover the costs of LASIK, since the issues that LASIK is considered cosmetic than medically necessary. After your LASIK evaluation your vision will be blurry for reading and you will be sensitive to light. Dark protective eyewear can help to ensure that your eyes are protected from the sunlight and from other bright lights. Your LASIK surgeon may prescribe lenses for glasses to be worn between your evaluation and the day of your surgery, but it is rare to get a new prescription for contact lenses prior to your LASIK surgery date. Be sure to ask all of the questions that you have about the procedure so that you are well-informed and have reduced anxiety about what may be expected on the day of the surgery itself. Take notes and ask for literature so that you can ensure you are aware of each and every step that you will experience during the procedure. The more you know, the less anxiety you will have leading up to the day of the surgery. How is LASIK Surgery Performed? How Long Does LASIK Surgery Take? Does LASIK Have Any Negative Side Effects? What type of anesthesia is used for LASIK surgery? What happens after LASIK surgery?